SAN JOSE, Calif.--(BUSINESS WIRE)-- Power Integrations (Nasdaq: POWI), the leader in high-efficiency, high-reliability LED-driver ICs, today announced the LYTSwitch™-6 family of safety-isolated LED-driver ICs for smart lighting applications. The new ICs deliver flicker-free output up to 65 W, and feature up to 94% efficiency and as little as 15 mW standby power, with configuration options for two-stage or single-stage PFC support. 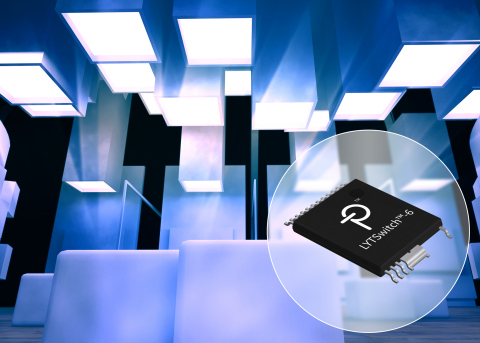 Targeting smart residential and commercial fixtures and low-profile ceiling troffers, LYTSwitch-6 ICs also exhibit fast transient response, which facilitates excellent cross regulation performance of parallel LED strings without additional regulator hardware, and allows easy-implementation of a pulse-width-modulation (PWM) dimming interface. LYTSwitch-6 ICs include both constant-voltage (CV) and constant-current (CC) operation, enabling lighting manufacturers to reduce the number of product variants, resulting in manufacturing and logistics savings. The new ICs are protected by an advanced thermal foldback system which prevents overheating while delivering as much light as thermally possible in any circumstance or installation. LYTSwitch-6 ICs feature a built-in 650 V or 725 V MOSFET and secondary-side FluxLink™ control which eliminates the need for an optocoupler and provides highly accurate output with better than 3% CV and CC over line, load and temperature. Power conversion for the flyback stage is more than 94% efficient, achieved by using synchronous rectification and quasi-resonant switching which enables high power output without a heatsink. For example, a 35 W, 12 V, 2.92 A design with an additional PFC circuit has been demonstrated to be over 89% efficient. Devices offer low standby power — less than 15 mW in universal AC input conditions – even with line voltage sensing, which allows the IC to protect itself from mains voltage surges and swells. LYTSwitch-6 LED-driver ICs are available now, priced at $0.84 in 10,000 quantities. A reference design (DER-637) describing a 35 W PWM-dimmable LED power supply with efficiency over 89% and a power factor greater than 0.9 is available for download from the Power Integrations website at https://www.power.com/lytswitch-6/. Power Integrations, LYTSwitch and the Power Integrations logo are trademarks or registered trademarks of Power Integrations, Inc. All other trademarks are the property of their respective owners.